A nineteenth century farm house set in the beautiful Minho area and restored to incorporate modern living standards whilst retaining many original features. Here can be found the real essence of Portugal where the only noise one is likely to hear, apart from the occasional car or the local churches chiming the quarter hours, are the farmyard sounds of chicken, sheep and cows. The farm can be rented as a single unit for a group of friends or separately, each house being independent and having a private terrace. There is a central laundry room and a large shared pool. The old wine making shed has been renovated to make the Lagar cottage. The huge stone tank where the grapes were trodden has been put outside on the patio and is being made into an attractive water feature. The old threshing floor can be seen nearby. The cottage has one double bedded room and additional sleeping accommodation for two people in an alcove off the living room. There are French windows opening onto a vine covered patio which is an ideal spot for outdoor meals. The kitchenette has a full sized gas oven a 4 ringed hob, a fridge freezer, microwave, dishwasher and other smaller kitchen appliances. There is a fully equipped bathroom with shower over the bath. Eating Out. Shopping: The nearest restaurant is just over a mile from the property and although it is traditional Portuguese fare good reports have been received regarding both quality and price. The restaurant also does a take away service. There are several good, family style eating houses in Paredes de Coura, a 7 mile drive away, whilst Ponte de Lima boasts some more elegant restaurants for a special evening out. There are 2 small supermarkets in Paredes de Coura where most requirements can be met and an Intermarché, Modelo and Lidl in Ponte de LIma. It must be remembered however that Portuguese supermarkets often do not accept Visa cards so money should be raised first at one of the numerous cash points. For good value for money, variety of products and high quality, however, we recommend a visit to Tui, just over the border in Spain where there is a large hypermarket and a Lidl supermarket. Places of interest in the immediate vicinity. 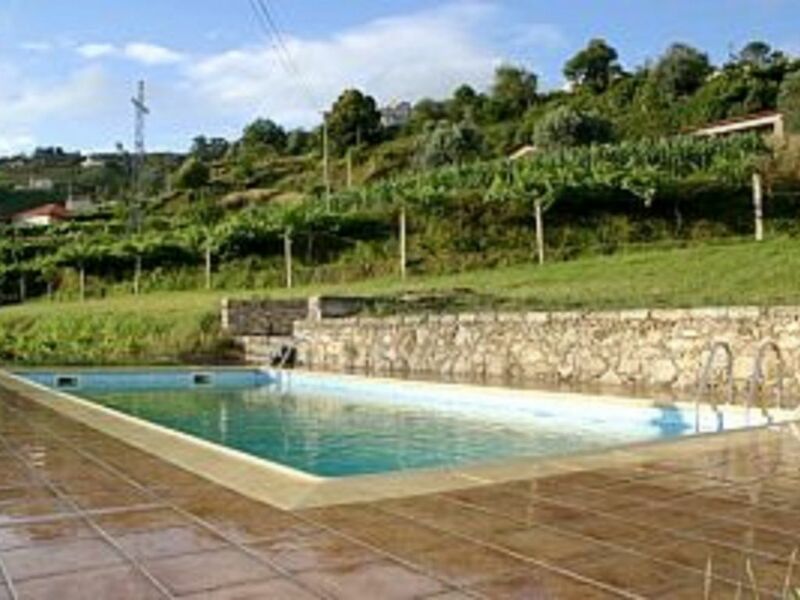 : A couple of miles from the property is the protected area of Corno de Bico. This wild park like terrain is ideal for walking or mountain bike riding. It is the habitat of many rare animals but those most usually seen are the semi wild horses which roam the area. The whole area is very good for walking enthusiasts and ordinance survey maps are available on request. Another local place of interest is the unfinished monastery church of Nossa Senhora de Secouro (Our Lady of Help) and the two local hilltop shrines of Nossa Senhora de Fatima and San Silvestre are worth a visit on a fine day to see the views they afford. Although the nearest sea beach is a 30minute drive, there are plenty of local river beaches for swimming enthusiasts. Look out for the sign 'Praia Fluvial', a very up market one in Paredes de Coura and many 'natural style' ones on the Lima River. Golfing enthusiasts have given excellent reports about the local course in terms of price, quality of play and beauty. Ponte de Lima: This historic town with its Roman bridge and medieval centre is a must. From the farm house it is fun to park the car on the north side of the river, cross the (now pedestrian) bridge and visit the town on foot. There is a bi-weekly market on a Monday which takes place on the river bank and there are various specialist markets at other times. There is also a nautical club where canoes can be hired, a riding school, (riding only on the premises) and the golf course. The north bank of the river has recently been developed into a series of gardens which make for a pleasant stroll. On the way in to Ponte de Lima there is a fish farm where visitors are lent rods and tackle and can catch their own supper. The trout is either grilled on the spot or you can take it home to cook yourself. Hang gliding is also practised in the area but this seems to depend very much on weather conditions and we have been unable to discover much about it. Excellent escape from the daily hustle and bustle. Superb rural surroundings away from the usual tourist trails. Everything for your stay is provided (even things you did not know you needed). Very good pack with all the information you are likely to need. The superb weather during our stay meant we spent most of our time out doors, dining, swimming and relaxing in the lovely spacious gardens. The location means a car is essential to appreciate the surrounding area, Margaret and Alex do all they can to ensure you enjoy your holiday. We have lots more to see and do in the area and hope to return with friends. It was great to meet you and so glad you enjoyed the farm as much as we do. Looking forward to welcoming you back again, as you say, so much to do and see. We stayed for 2 weeks in Lagar Cottage and we absolutely loved it. It's a great property, exceptionally well equipped, with a lovely garden and pool set in beautiful countryside. Perfect for some peace and quiet and relaxation. Thanks Mikka. We loved meeting you both and hope you enjoyed watching Porto play in their new Dragon Stadium. Well done for picking up the tickets without getting lost! We do try to support our visitors if they have anything special on their wish list and we were really happy to help you see the game. Looking forward to seeing you again sometime, maybe for more football! A and M.
seeking a nice place to stay in portugal on short time notice we found that very cosy, nice located "farmhouse" with a very well equiped kitchen and everything you could wish for. the sight was overwhelming and the pool in superb conditions. we were travelling with our 11month old daughter - she loved it. it was just charming, old steps, fireplace, two very cosy bedroums and even we were given a crip for our babygirl. all in all very rural but with comfort. next town is more or less easy to find (more dificult was the way back - seems like nobody knows "portal do pedro"). car is necesary! the owners left manuals for everything, maps and prescriptions for visiting-worth places in a folder - everything in english. we'll try to come back! We really enjoyed meeting you both and your delightful baby daughter. Galicia and Minho being adjacent provinces make for quick and easy weekend visits and we would very much like to see more Spanish visitors come to our property. We, ourselves, often go over to Spain for a weekend. Hope to see you all back here again soon, maybe with some friends for the other cottage. Lagar cottage and the surrounding property is the perfect place for a relaxing summer unwind! We were only able to spend 4 nights at the cottage and because of the short stay did not feel that we needed to go out and about too much, in fact apart from the odd trip to Ponte de Lima for golf and food supply's we pretty much stayed put. The cottage was well equipped and very comfortable, even with 4 adults in it and thanks to the fabulous weather that we experienced we were hardly inside. The table under the grape vines was where all meals were eaten and most days were spent lounging by the pool. The views of the country side were beautiful and there was constant peace. We will definitely be coming again, have already been recommending it to friends and would like to bring some along next time. Unfortunately we didn't get to meet Margaret and Alex however Sylvia was available for anything that we needed. Thanks again for sharing your delightful cottage with us! We are so glad that you enjoyed your holiday but very sorry that we were unable to meet you this time. One of the perks for us is meeting our visitors and making sure everything is just as they like it. As you so correctly say, the cottage is ideal for relaxing and lounging even in the winter but there is plenty to do and see if one is feeling energetic. Many thanks for your kind words and we look forward to meeting you one of these days. Das Anwesen liegt sehr ruhig, die Ausstattung ist vorbildlich und die Besitzerin sehr Aufmerksam. Many thanks. We try hard to give our visitors the best of everything and are really grateful for your appreciation. So pleased you enjoyed your stay despite the rather unseasonable weather.